No sooner had I posted a long piece on Politics And The Fashion System than two stories reached me from Ethiopia that embody the profound rift between old and new models of development. One story, representing a hopeful future, was a celebration of the footwear company Sole Rebels, by the World Fair Trade Organisation, as the world’s first fair trade footwear company. It’s an inspiring tale. Founded in 2004, Sole Rebels employs and trains highly marginalized people who go on to earn three times the industry average (see pic above). The company uses recycled car tires together with organic and bio-based materials; it sources these from small scale organic and traditional growers and spinners. 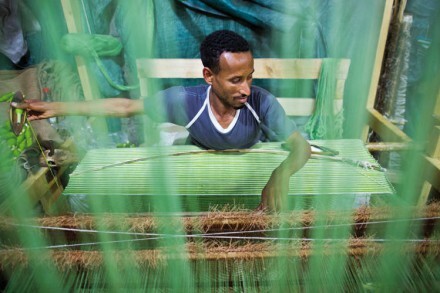 Its fabrics are hand-loomed on eucalyptus looms – a method, unique to Ethiopia, that had deep cultural roots. Sole Rebels’ leather is sourced from traditional small scale free-range animal owners. Its packaging is made from recycled shipping cartons. 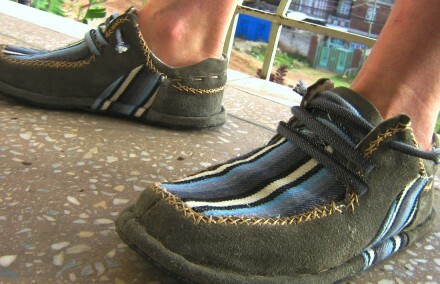 Each pair of its shoes (below) is shipped in re-useable hand loomed cotton bags. At the same time, just as Sole Rebels emerges as an inspring model from Africa, the Chinese firm Huajian, which makes shoes for Tommy Hilfiger, Guess, Naturalizer, Clarkes, and other western brands, is building a vast ‘shoe city’ in Ethiopia (below) that takes the globalisation of the fashion system to a new level. This global hub for the shoe and accessory industry – ‘a one-stop shop for manufacturers similar to us’ – will house up to 200,000 guest workers on wages that, at US$35 a month, are ten times lower than those in China. Seven-year tax breaks, regulatory exemptions, cheap land, and ‘cost-sharing schemes for foreign experts’ are among additional attractions to global firms. 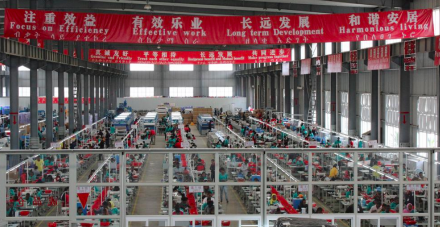 Cheap labour is not the only driver of this global reconfiguration of fashion production. Cheap raw materials, and cheap nature, are an added incentive. Forty million people – 60 percent of the population – own livestock in Ethiopia. Herders and family sheep owners typically receive around $2 for the skins that will be used to produce items such as the Cabretta golf glove that retails for $25 in the US. Herders are paid $10 each for hides that end up as coats sold in rich countries for $500 upwards. For global fashion brands, hedge funds, and a small army of consultants, these enormous margins justify the massive expansion in leather production that Shoe City represents. This approach to development makes good sense in traditional economic terms – but terrible sense to the country’s ecological prosperity. For Ethiopia’s soils, rivers, and watersheds – and the people and animals who steward them – industrial expansion on this scale portends terrible damage. Tanning also has one of the highest levels of toxic intensity, per unit of output, of any industrial process. During the different procedures used for hide preparation, tanning, and finishing, at least 300 kg chemicals are added per ton of hides. The huge discharges of air, liquid and solid waste pollution generated by tanning contain chromium, copper, cadmium and other toxic by-products. Effluents released on the land, or dumped into the surface water, are associated with skin blisters, diarrhoea, gastroenteritis, urinary tract infections and liver diseases among workers and their families living near tanneries. It’s not as if these problems have been wilfully ignored. Many African countries have passed environment protection laws that are aligned with international standards. In addition, the tanning industry in Ethiopia is under pressure to move towards full recycling of the wasted chemicals it emits during its processes. Some concrete steps have indeed been taken. One of Ethiopia’s biggest facilities, Modjo Tannery, which has been discharging toxic wastewater into its river for 50 years, is building a $500 million biological waste treatment plant that will reduce the amount of toxic wastewater coming from the tannery by about 20 percent. These mitigation initiatives are constrained by the brutal realities of a globalised industry. For one thing, downstream cleaning of effluent removes some – but not all – of the most dangerous toxins. The most effective methods, such as membrane filtration, or oxidation by ozone, are expensive – and in any case are not ready to he deployed on an industrial scale. As Shoe City’s production ramps up, the result is likely to be more toxic pollution, not less. Extreme time pressures are a further impediment to downstream clean-up. ‘Clean’ tanning takes far time than the toxic industrial kind – but Shoe City’s model is based on fast response times. It literally cannot afford to wait. The whole point of Shoe City is to to minimise costs – not to to look after the country’s poor farmers or ecosystems. Its business model is based on the procurement of raw materials as cheaply as possible from a source, the tannery sector, that is fragmented, and under-capitalised. 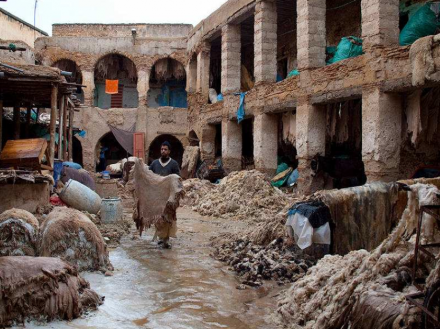 The burden of upgrading the country’s tanneries falls on Ethiopia’s government – not on Shoe City. 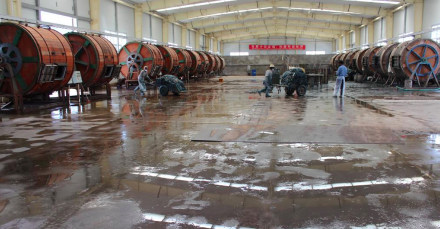 Having granted Shoe City tax-free status for many years ahead, it’s hard to see how the government will be able to afford the large capital outlays needed to clean up its tanneries using costly technology. As I argued in in a previous post, an incremental ‘do less harm’ approach in fashion has addressed the symptoms, but not the principal cause, of our difficulties: an economy based on perpetual growth in a finite world. Sole Rebels, although tiny, is the harbinger of a ‘leave things better’ regenerative economy that affirms our co-dependency with living systems and the biosphere. Shoe City, although vast, is the expression of a exploitative and unsustainable model whose time is up. What will it take for the new to replace the old – and not just co-exist with it? The next step, surely, is for the global ecosystem of sustainable fashion pioneers to put the health of the land, and the people who live on it, at the centre of their story.